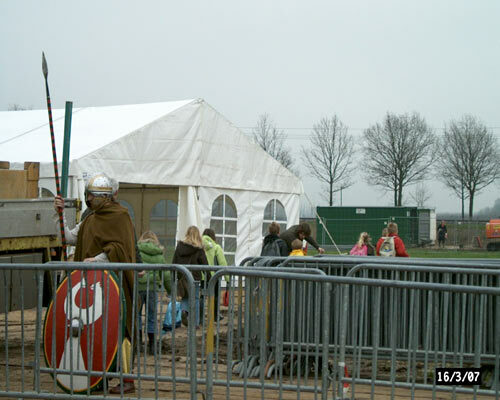 My home town Houten, although not blessed with many visible Roman remains (besides some signs of former villas and of course a Roman funeral monument), suddenly hit the news when the remains of a Roman road were found. 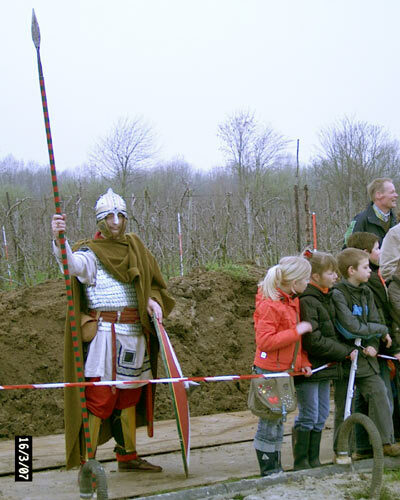 Roman roads, although criss-crossing Europe from one end of the Roman Empire to the other, nevertheless are still hard to find in some areas, which is why several archaeologists sudden sat up straight when the news was released. Not that it was much of a surprise. 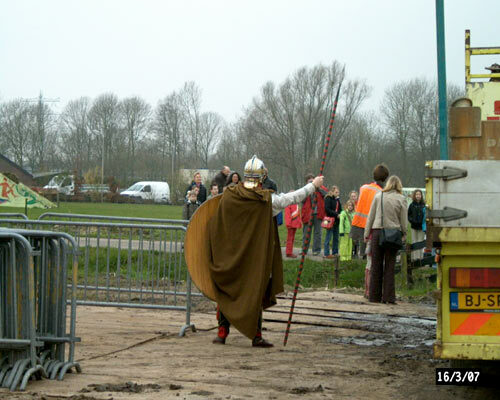 The northern frontier of the Empire was formed by the old stream of the Rhine (Oude Rijn as its called here) and it had recently been established that along the river, although some distance from the stream itself) a road had existed during Roman times. 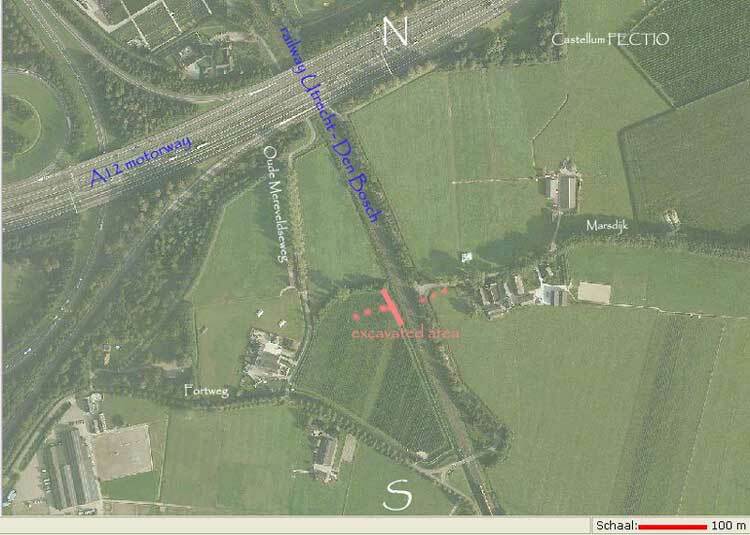 Therefore, when plans were made by ProRail to widen the railway line from Utrecht south to Den Bosch, it was expected that at some point the road would turn up. And so it did. The road itself is no big affair. No layer upon layer of stone forming a mighty dam, none of that. In the soft soils of the middle of this swamp (which is what is what I can call most of my country), such an agger could not exist. 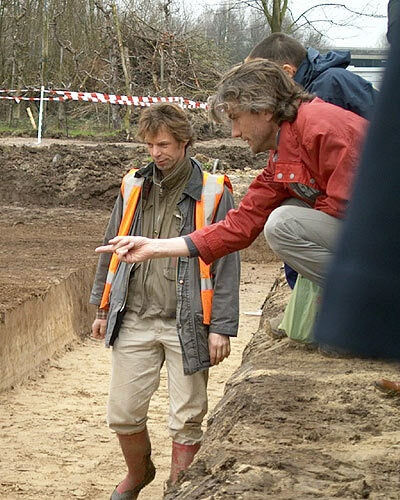 Which is why the road is formed by several layers of sand and gravel, or, as archaeologist Cees Koot formulated; it looks more like a tray of kitty litter then a Roman road. And he was right. 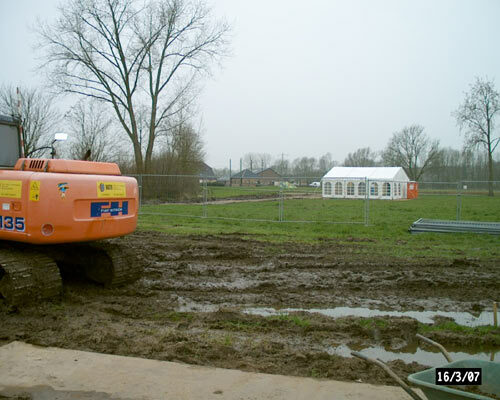 Nevertheless, it was important enough for the local government (Gemeente Houten) to pay a visit to the site, organised by ProRail. And I was invited to give the site some Roman connection, a bit more visible, colourful than the road itself, at least. 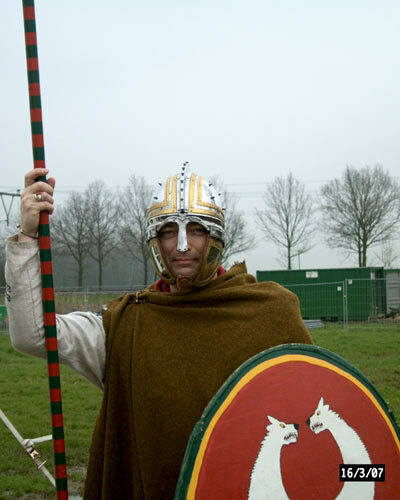 This is by no means the only Roman site in Houten. Most, unfortunately, are invisible (as the road no doubt will be later this year). 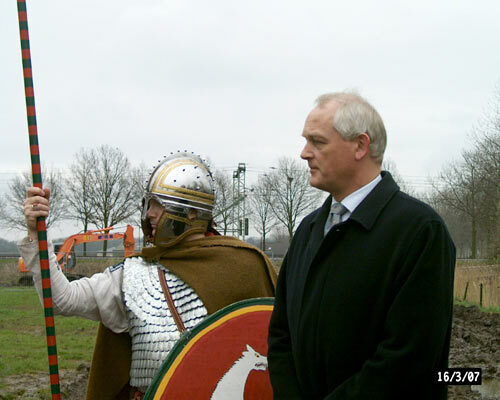 However, look here for a Roman funeral monument, found and displayed in Houten. 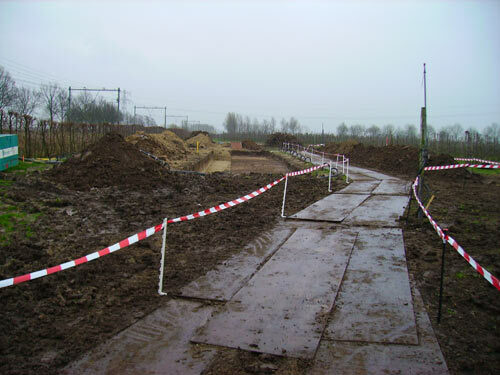 The site could be classified as a big hole in a pool of mud. Or it was at least that morning, after a week of rain. The fields, which slope down a bit towards where the river once flowed, were kind of soaked, and the mud on the metal plates that formed a track to the site, clung to my soles, making every step a slippery adventure. Surprisingly, the road lies just 50 cm under the field. 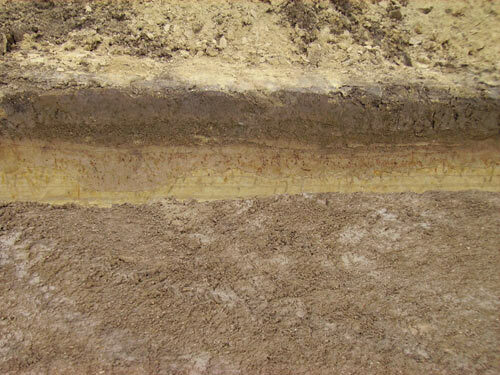 For a river valley thats kinda odd, one would suppose that some more sediment would have been added in the meantime. Apparently not, or maybe the road had been in use after the Roman period. A tantalising though, also because it seems that the alignment is similar to that of the modern Marsdijk, which runs south of the original castellum Fectio, and which may indeed form the continuation of the old Roman road itself. Future research will hopefully establish that. Another, minor, road was found to the north, covered with shells only, which might be an earlier road or the road to the castellum itself. The event nearly passed me by because originally I had been scheduled for the Open Day for the general public. 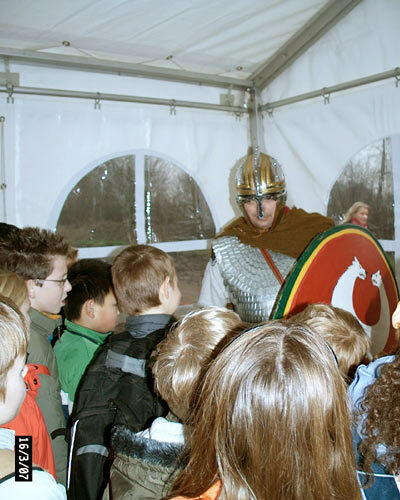 However, when a school visit fell through it was decided at the last minute (almost) that I should turn up on Friday, to accompany the visitors from the school and the Council. 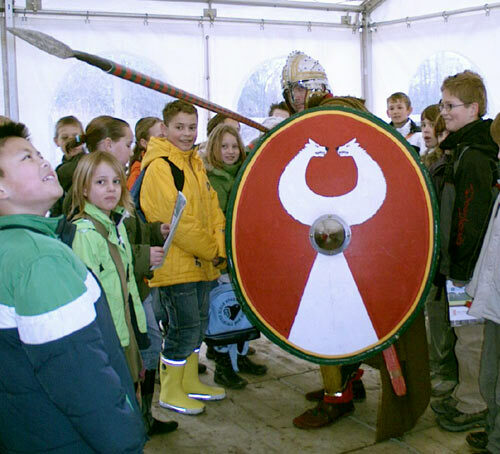 The school came first, two classes of group 6 (9 to10 year olds) from a local school called De Vlinder (The Butterfly), who had been prepared through a project and had been told about Roman times twice before, so I was number three. Nonetheless, it seemed they had not met a heavy infantryman before, which apparently they thought was a nice surprise. 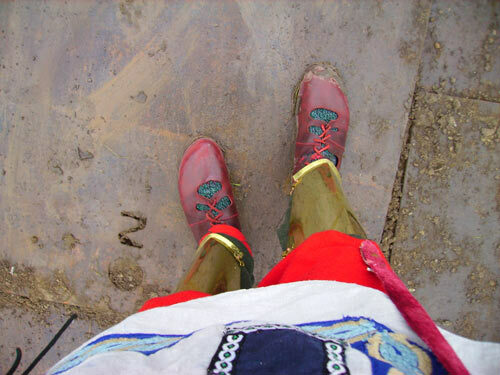 The kids were shown around the dig site and I slithered along, sometimes almost losing my footing on the mud-covered metal plates which were used as a temporary path. Cees Koot did a good job answering their questions, which were of course different from the ones he would be asked normally. I think they enjoyed their visit very much. 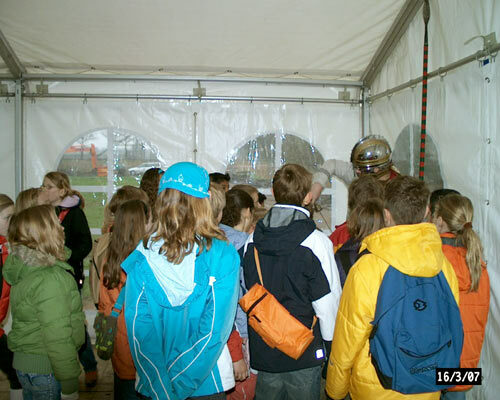 Afterwards we went back to the tent where ProRail had a small exhibition. The kids then completely backed me into a corner asked all kinds of questions. Quite fun. After the school had gone, it was time for the officials. 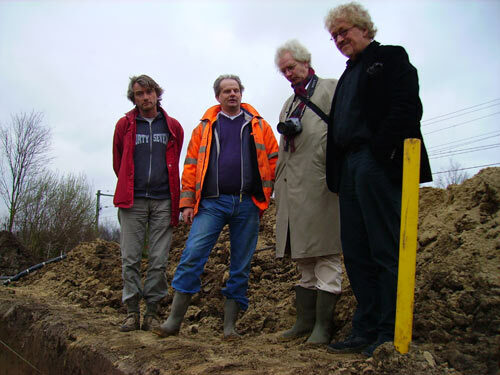 The mayor and complete Council of Houten, plus many of the top civil servants came to have a good look at what was dug up in their County. 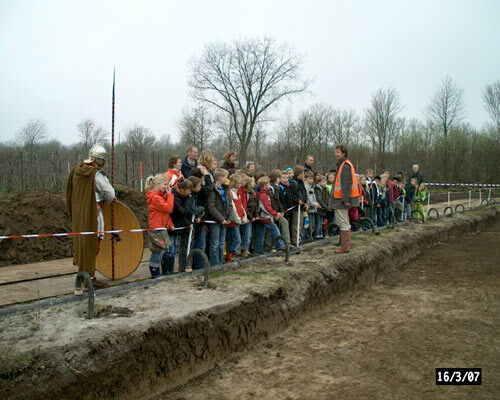 They were accompanied by the responsible people from ProRail and the archaeologists from Vestigia, who carried out the dig (http://www.vestigia.nl/) and other projects. Of course this visit was quite a bit different than the one we just saw before. 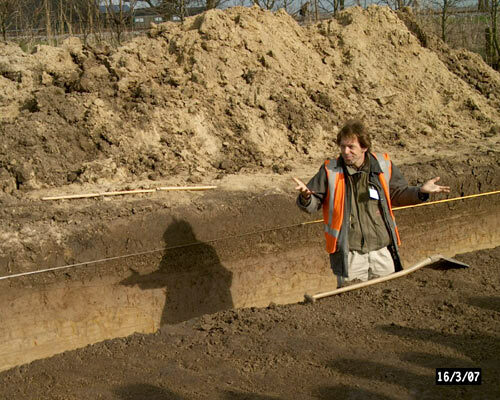 Cees Koot again explained in detail was there was to be seen in the trench, and everybody was quite interested in what was visible, and what was not, and why. 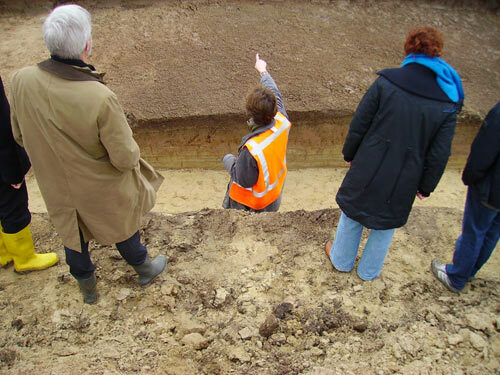 Some had fully expected a real Roman road, complete with hard shoulder and speed bumps, and were a bit disappointed when all there was to see was a profile of gravel, no matter how interesting for the experts! 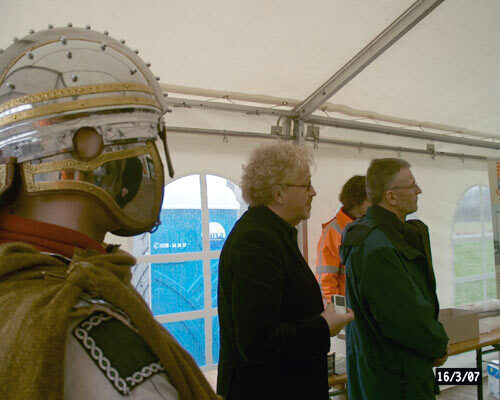 Wilfried Hessing (Vestigia) held a small presentation afterwards, explaining what the Romans had done in these parts and what we still (want to) find of that activity. 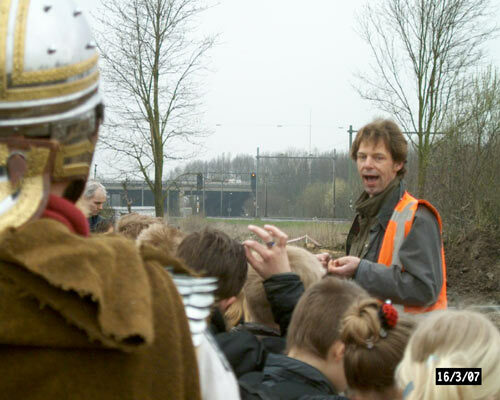 I like that final gesture of Cees Koot though: "sorry, but we don't have a clue"..